Shortly after the BBC Radio production of Neil Gaiman's Neverwhere began to air, ComicBook.com reported on the Sacred Fools Theater Company in Los Angeles, who were mounting a stage production of the work. Many of our readers from around the country expressed that they wished they could see the show, and that they wondered how it would turn out—and while we don't have anyone on the West Coast ourselves (alright...we do, but she also works for the Sacred Fools and cannot review it), we have the next best thing: Some thoughts from Neil Gaiman! Neil Gaiman attended the April 28 show with his friend Kirsten Vangsness (From TV's Criminal Minds). He has been tweeting about Neverwhere at Sacred Fools for weeks, even wishing a happy birthday to Devereau Chumrau, one of the actors who plays Hunter, a few weeks ago. So it's probably not surprising that this week when his schedule placed him in Los Angeles, he made sure to stop by. Gaiman was in L.A. doing an interview with Carson Daily about his upcoming Doctor Who episode "Nightmare in Silver," which airs in two weeks. After the performance, Gaiman greeted and took photos with the cast, crew, and any fans who hung around to meet him. He called the show "Glorious," "Gloriously ambitious," and "Beautifully directed." The writer said that his favorite part was watching the play with Kirsten, who has never read the book and during intermission and after the show would excitedly proclaim things like "I didn't know he was a villain!" 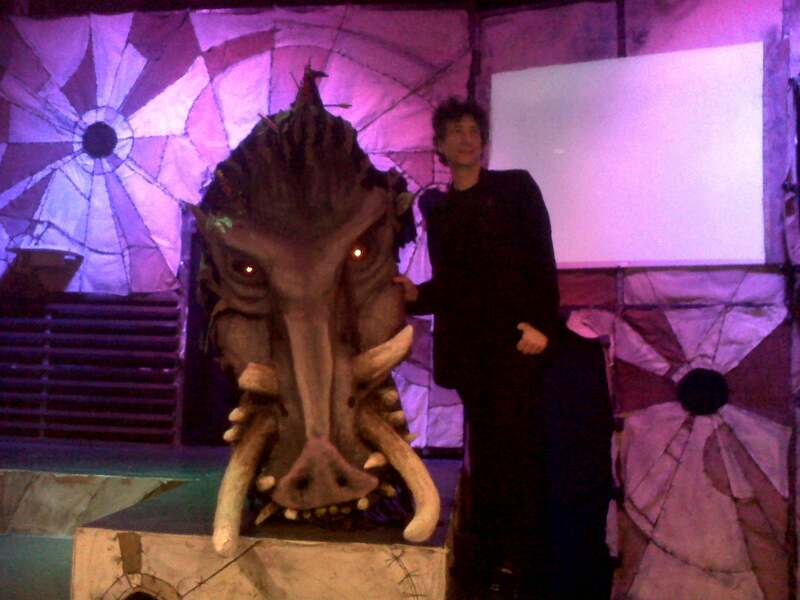 Aside from posing with the cast and crew, Gaiman also posed with various props and costumes, such as the Great Beast of London [pictured above] and the garbage covered cloak worn by The Marquis de Carabas. Neverwhere has been well reviewed and its run was recently extended to May 25th. The exact dates and some nice quotes can be found at the production's official website. You can see interviews with the director and cast below.